"Let us consider that Paradise is our country, as well as theirs; and so we shall begin to reckon the patriarchs as our fathers. Why do we not, then, hasten and run, that we may behold our country and salute our parents? 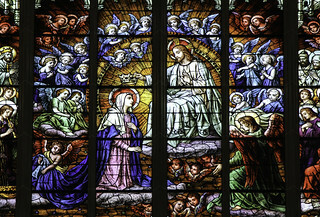 A great multitude of dear ones is there expecting us; a vast and mighty crowd of parents, brothers, and children, secure now of their own safety, anxious yet for our salvation, long that we may come to their right and embrace them, to that joy which will be common to us and to them, to that pleasure expected by our fellow servants as well as ourselves, to that full and perpetual felicity…"
– St Bede the Venerable, whose feast is today (25 May). 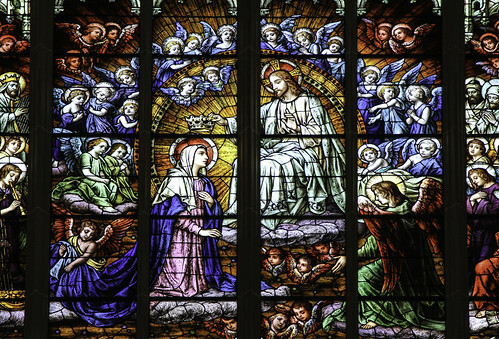 This stained glass vision of Our Lady crowned in heaven is in Covington Cathedral.